Part 1 in a series discussing the etiology, assessment and management of atypical wounds. As devoted clinicians to the field of wound management we take a responsibility to educate ourselves and others about wound etiologies and characteristics, as well as management of barriers to achieve positive outcomes. We spend a great deal of our careers learning about the most common offenders, such as pressure injuries, diabetic foot ulcers, venous stasis ulcers, arterial wounds, amputations, and traumatic wounds, to name a few. However, as our careers unfold we are faced with extra challenges, and atypical wounds are among them. An atypical wound, also known as a wound of unknown etiology, is caused by a disease or condition that doesn’t cause a wound typically. Inflammatory diseases, infections, chronic illnesses, malignancies, or genetic disorders are examples of diseases that may result in the appearance of a wound. Atypical wounds can also arise from rare causes and usually share uncommon characteristics. In this two-part blog series, I discuss a few atypical wounds, to give you a view of this parallel universe. pyoderma gangrenosum is an uncommon, non-infectious autoimmune disorder that is associated with inflammatory diseases such as ulcerative colitis, Crohn’s disease, various arthritides, hepatitis, myeloma, and systemic lupus erythematosus, among other inflammatory conditions. The condition starts as small, painful papule, pustule, or nodule with an erythematous base. As lesions grow, ulcerative necrosis develops. Other characteristics include more common occurrence in middle-aged women and ulcerations that may develop into multiple, well-defined wounds encompassing large areas of the body. These wounds have violaceous borders with surrounding erythema and pain. Treatment of pyoderma gangrenosum involves topical wound care with use of topical steroids, protective dressings, and even local antimicrobial agents, to name a few options. This type of wound requires a biopsy for proper identification. Debridement of these wounds is contraindicated because they may worsen, particularly over the area debrided, a condition referred to as “pathergy.” A systemic approach to management includes steroids, immunosuppressants, tacrolimus, and antimicrobials. Once the condition is stabilized with immunosuppressant therapy, cellular and tissue-based products and even split-thickness grafts may be considered. Calciphylaxis is a condition that is associated with high calcium phosphate levels, leading to vascular calcification of small arteries at the tunica media of the vessel and ultimately necrosis of the affected tissue. This disorder is common in individuals with end-stage renal disease and hyperparathyroidism. Calciphylaxis wounds do not have a specific location, and affected areas include fingers, toes, tongue, peri areas, and torso. Characteristics include irregularly shaped vesicles, beginning as light violet or purple mottling, evolving into patches or plaques of necrosis, and usually becoming full-thickness wounds. Calciphylaxis wounds are very painful, and a proper pain management protocol is of high importance. Wound management includes surgical debridement and, rarely, bedside debridement. Negative-pressure wound therapy, advanced wound care products, and cellular and/or tissue-based products are appropriate therapies and interventions once the wound is stabilized and free of non-viable tissue. Antibiotics are used as needed for the presence of systemic infection, and surgical consultations may be indicated for evaluation for renal transplantation and even parathyroidectomy. Coordination with a nephrologist is crucial because, in view of the high calcium phosphate levels, the use of a low calcium dialysate would need to be considered and monitored by this specialist. Consultation with a dietitian is recommended to assist in attaining and monitoring safe nutritional levels of calcium and phosphate. Sickle cell anemia is a condition in which mutations in hemoglobin formation cause red blood cells to deform and collapse, leading to significant physical pain and emotional distress in patients who spend their lives dealing with this genetic disease. Sickle moon-shaped cells are the result of this disease and causes extreme pain as the cells travel, with consequent occlusion that leads to localized ischemia. The wounds are commonly located at the medial and lateral malleolus, the pretibial areas, and in the dorsum of the foot. They manifest as single wounds or in clusters (multiple). Wounds can communicate and become a single large, circumferential wound. The periwound area is hyperpigmented, hair is present or absent, and edema and thinning of subcutaneous tissue are noted. 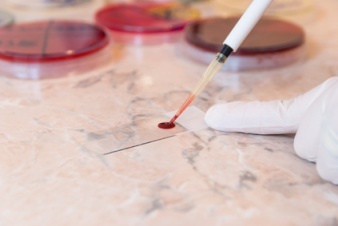 Laboratory values and imaging studies to confirm the diagnosis include hemoglobin S, blood smear, multiple other hemoglobin tests, radiography, and magnetic resonance imaging. Treatment of sickle cell ulcers includes antibiotics if infection is present, surgical debridement for removal of tissue necrosis, and Unna’s boot for management of edema. Non-healing wounds benefit from blood transfusions, and further research is being done on hyperbaric therapy in this context. The use of advanced wound care products is appropriate. In conclusion, as we determine the etiology of the wound it is crucial to continue to engage the assistance of the SWAT team (skin wound assessment team) and involve specialists to manage barriers and to follow the moist wound healing path to achieve positive outcomes. As always, as we determine the etiology of the wound, management of barriers becomes more feasible. Atypical wounds are commonly chronic because, given their uncommon presentation, the etiology takes longer to determine. The treatments mentioned earlier for atypical wounds are only some of the available therapies. Research remains ongoing into the causative diseases, and new treatment protocols are being explored. As always, please refer to guidelines, evidence-based research, standards of care, and best practices to achieve positive outcomes, and stay tuned for the second part of my blog for more insights into atypical wounds. Atypical wound basics. Wound Care Centers. https://www.woundcarecenters.org/article/wound-basics/atypical-wound-basics. Accessed February 1, 2018. Martin Vera is a certified wound specialist with over 20 years of nursing experience, with a passion for wound management and patient-centered care.